Is it bad that I am desperate for Fall weather??? I love the summer produce, but I am wanting rain and crisp sunny days. Granted we have had a few awful heat waves this summer, but it is so unlike me to not want warm weather! Anyhoo. These burgers, oh my goodness. Anything stuffed with cheese has to be good right??? Especially burrata, it's so dreamy. I didn't make a snazzy spread to go with these because, to be honest, I was hangry. Sometimes it is pure torture making something for dinner, and then photographing it. Gah. But as I was chowing down, I realized it didn't really need it. 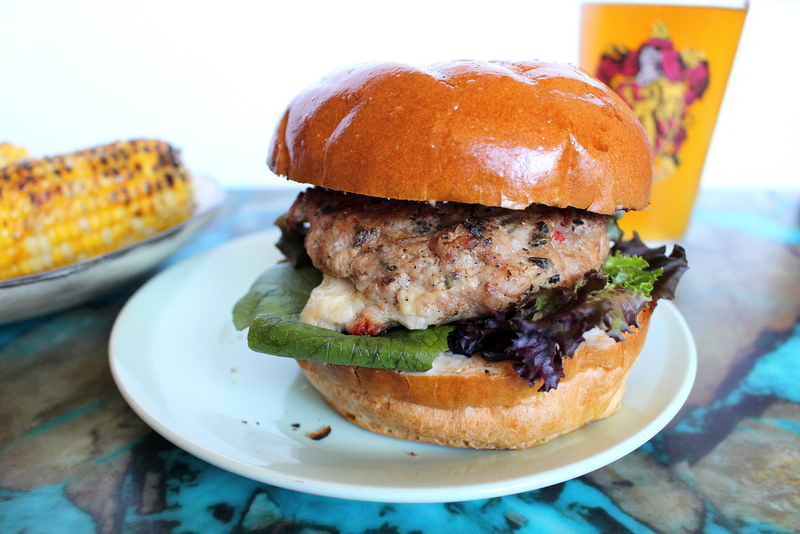 There is so much flavor in the burger itself that a light smear of mayo and some greens were perfect. Pesto would be great too, but I didn't have any on hand. And you see that grilled corn, it has SRIRACHA BUTTER on it. Do it. Turn your grill on to medium-high heat. In a large bowl combine the ground turkey, sun-dried tomatoes, basil, garlic powder, salt, and pepper using your hands. Divide the mixture into eight equal-sized balls, then flatten them with your hands. Take one of the patties and place a piece of burrata in the center, top with another patty and squish it all together. Using your fingers, seal the edges so minimal cheese is lost. Repeat with the remaining ingredients. Grill the burgers, about 5 minutes on each side. To assemble smear a bit of mayo or pesto on each side of the bun. Add the burger patty and top with greens, and eat! Yes, that is a Gryffindor pint glass. HP for life.